"Rule of Law in Hong Kong History Demythologised: Student Umbrella Movement of 1919"
Abstract: English law is central to the history of colonial Hong Kong. Traditional colonial historians conceptualise it as a gift to the colonised, and it is still widely acknowledged by Hong Kong citizens today as a core contributing factor to the city’s continued growth and prosperity. The traditional narrative is that the rule of law, which embraces the principles of judicial independence and offers such safeguards of individual liberty as freedom of expression, is the most important legacy of British colonial rule, a legacy that is very often cited to distinguish the legal and societal development of Hong Kong from that of its neighbour across the border, mainland China. 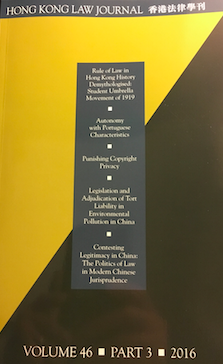 This article, drawing on unexplored archival materials, challenges this widely accepted narrative, thereby severing the link between common law’s legal past and present in Hong Kong. Through a close reading of a widely reported court case concerning students’ anti-Japan movement in 1919, the article further argues that the common law system practised in pre–World War II Hong Kong played a more important role in reinforcing an authoritarian form of colonial law and order to achieve the British Empire’s strategic aim of maintaining its overseas territorial and economic possessions than in safeguarding individual liberty and the impartiality of the judicial process.